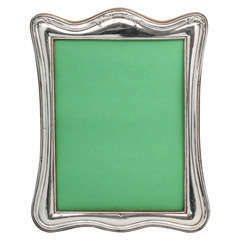 A very smart and elegant picture frame, made from a thick band of sterling silver wrapping around the sides of the solid Oak backing. The silver is fully hallmarked for Birmingham 1905, Edwardian in era and is incorporates the makers mark for the top quality silversmiths, Mappin Brothers of Sheffield and London. Perfect for both a contemporary or traditional interior in excellent condition. A good size measuring 10" x 8" with a glazed aperture measuring 8" x 6" to accommodate your favourite photograph. Item ID: 40860 Free Worldwide Registered Airmail Directly From London, England.